The day is almost over here on the East coast, but there is no way that I could let this day (January 25th) end with acknowledging how special it is to me and so many others out there. 13 years ago today, Cervivor was founded (as Tamika and Friends, Inc.). This organization was founded out of my own cervical cancer diagnosis 16 years ago. My experience with cervical cancer not only changed my life but also, everyone around me. I made a promise that if I survived this experience that I would make my survivorship count. I honor that promise with every single breath I take. 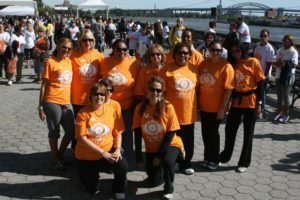 When I created this organization I had no idea that January was Cervical Cancer Awareness Month, or that teal and white were the official colors for cervical cancer — there was a lot of orange! All I knew is that I wanted to make a difference in the lives of others. I didn’t know how or where to start. I just knew that I had to do something. As most nonprofits, we started small — very grassroots. Sometimes I sit back and think of our first official meeting — the binders that I created with orange butterfly stickers. They were hideous, but filled with an action plan that has brought us to where we are today. I sit and think of all of the things we’ve done since then, and it just seems surreal. We held so many events over the years, but what I’m most proud of is the community that we’ve created. 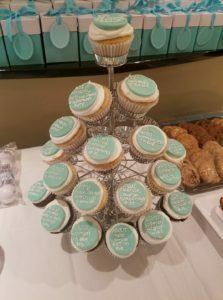 A community of not just women diagnosed with cervical cancer, but a community filled with caregivers, clinicians, researchers, health educations, social workers and so much more. I am proud of the industry partnerships and their support of our much-needed work. A lot of work that goes unseen, but is felt around the globe. Today also marks 4 years since we launched Cervivor School — our advocacy training retreats. 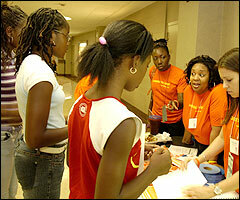 We’ve had over 100 women graduate from our Cervivor Schools. 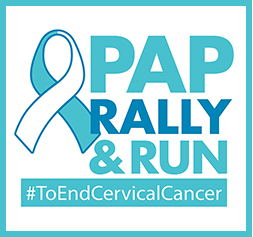 This unique event is the leading advocacy training for women diagnosed with cervical cancer in the country. 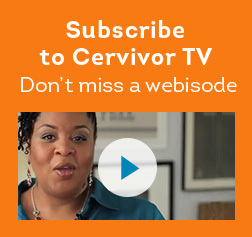 Our Cervivor School speakers are some of the most sought-after experts in the cervical cancer space. 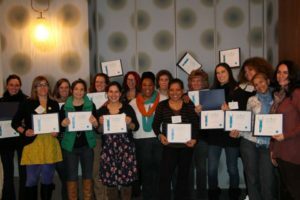 Our graduates are some of the most requested cervical cancer patient advocates. This year will mark the return of some of our original programs and events (hello Stirrup Stories! ), as well as new campaigns (I can’t wait for the big reveal!).  We’ll continue providing our community with support and the latest news and updates. 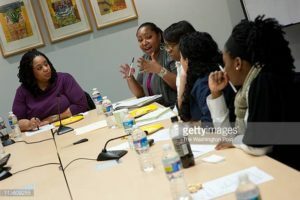 Our work has afforded us a seat at the table, and we are thankful for that. We’ve worked hard for that. My promise to you, our community is that we will continue to be an expert in the field of patient advocacy. We’re not going anywhere! Not while there are still women not being screened. Not while the HPV vaccine is still underutilized. Not while the stigma of HPV exists. Not while women feel alone. Not while women are losing their fertility, and not while women are still dying. There is way too much work for us to still do. I’m more determined than ever. I know you are, too! You’ve shown it this month alone. Thank you for your continued support — however small or large. 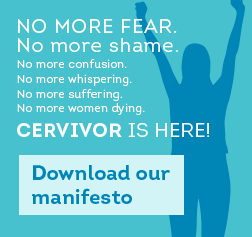 Thank you for helping us spread our Cervivor footprint. 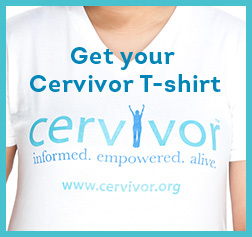 Thank you for helping us end cervical cancer. Never in my wildest dreams could I have imagined that we would be here. But, here we are 13 years later, dedicated to what we started, still doing what we said we would do – working to end cervical cancer. It hasn’t been easy, but neither was cancer. 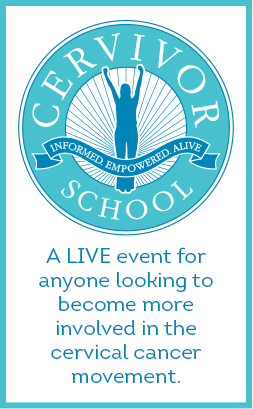 Apply to attend our upcoming Cervivor School here. A few months ago I started planning for what would be my “coming out” party so to speak. Kind of like a debutante coming out to society, I wanted the world to know that I had cervical cancer caused by HPV. Wow that felt so good to type. The event was planned for January during Cervical Cancer Awareness Month and the idea was simple, have a few close family and friends over to hear my story, watch the movie Someone You Love: The HPV Epidemic and answer any questions. I had no idea how much of impact this event would have. So let me rewind a little bit and tell you what brought me here and my “why”. In 2009, I heard those three awful words, “you have cancer”. 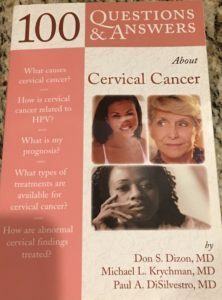 I had cervical cancer and it was a result of HPV 16 and 18. What is that you ask? HPV is the human papillomavirus and there are more than 100 types of HPV and just a little more than a handful are high risk or cancer-causing. HPV 16 and 18 cause about 70% of cervical cancers. When I was first told I had cervical cancer I had no idea what that meant. I had no idea what HPV was. More importantly, I didn’t know anyone who had or was going through what I was. It was extremely lonely. Not only could I not relate to others, I had family members who associated HPV with a stigma and told me things like it was because everyone sleeps around. That hurt beyond imagination. I was silent about HPV. Someone I looked up to made me feel like I did something wrong. But I didn’t, they were just ignorant. At the time I did what I do best, I went to the bookstore to find anything that may help me. 8 years later, 1 LEEP, 2 cone biopsies, an infection that almost killed me, 11 lymph nodes removed, and a hysterectomy I have finally found my voice to tell my story, I discovered “my why”. I have finally found the courage to talk about HPV. That brings me to my event, my “coming out” so to speak. 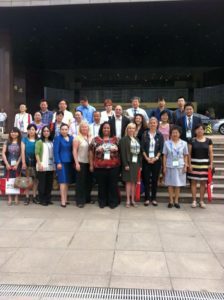 There were about 15 people in total that included family, friends, and neighbors. Most everyone there had children ranging from around age 7 to their early 20s. To make the evening more special I was honored to have Tamika Felder, the founder of Cervivor there by my side; and I was honored to have Kelly there representing Team Jillian. 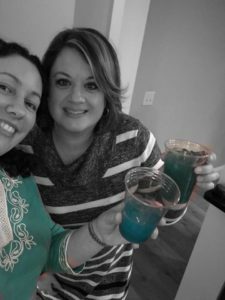 Jillian is a Cervivor sister we lost this past September and I love that her close friends and family honor her by continuing to talk about cervical cancer and the HPV vaccine. around to make a few comments and tell my story. It was the first time I did this to a group. I was so nervous, but once I started talking it was so easy. I believe it was said in Cervivor School, no one knows your story better than you. My best hope for the evening was that I would tell my story and we would watch the movie. My goal was getting me over the nerves hurdle with people I knew. But wow my goal was exceeded. At the end there were questions. There was interest. There were women who were ready to go back to the doctor. Moms who wanted to share the information with other moms in our community, people who were happy their kids had the vaccine, but they didn’t understand at the time how important. Knowing that I was able to reach someone with my story, for me this was most definitely a tiny spark that had lit a mighty flame. 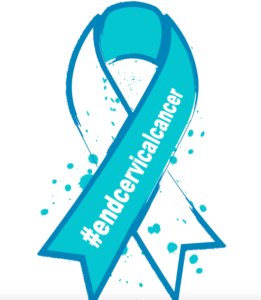 January is Cervical Cancer Awareness Month – there is still time. Are you ready to have your “coming out” and share your story? 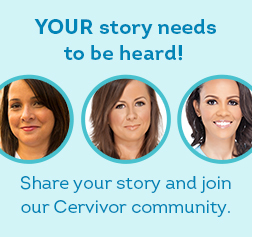 Cervivor is a great place to share your story and it has an easy to follow format which can guide you.